Prime Minister Dr. Abiy Ahmed held separate talks with Saudi Arabia’s Foreign Affairs Minister Adel al-Jubeir and United Arab Emirates (UAE) International Cooperation State Minister Reem Al-Hashimi on bilateral and regional issues of mutual concern. 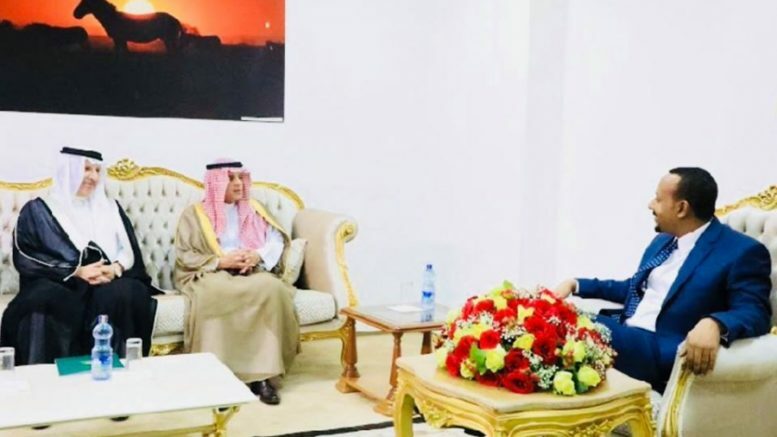 According to Office of the Prime Minister, Premier Abiy exchanged views with the FM to transform Ethio-Saudi age long people-to-people ties with strong economic partnership. Accordingly, Ethiopia and Saudi Arabia reached consensus to enhance partnership in economic, political and cultural sectors among others. Among the Middle East countries, Saudi Arabia is Ethiopia’s major economic and political partner. In related development, the Premier conferred yesterday with UAE’s International Cooperation State Minister Reem Al-Hashimi on ways the two countries translate the previously signed investment agreements to practice. Studies are underway at technical level to implement the various agreements Ethiopia and UAE signed at various times. The two officials came to terms for the speedy commencement of real estate and resort constructions. The two countries agreed for the construction of a gas pipeline that stretches from Addis Ababa to Port of Assab and consensus was reached to conduct studies on the project. The State Minister reportedly expressed her country’s keen interest to exploit Ethiopia’s investment opportunities. The ongoing normalization with Eritrea avails the opportunity to UAE enhances its economic partnership with Ethiopia. The Ethio-UAE bilateral relationship has shown great momentum since country’s Crown Prince Sheikh Mohammad bin Zayed Al Nahyan paid official visit here in last June. The two countries signed agreements to expand investment and tourism cooperation and waving the visa requirement for Diplomatic visa holders during the Crown Prince’s visit.